My Dance Mama Paulette (Mama P) likes to talk about how Tribal is not just a dance – it’s a whole lifestyle! You’ll hear me say this a lot too and I completely believe it. Why? Because once you get hooked on this fantastic fun dance you realize that we need to strengthen our body and really care for it so that we can keep dancing for many years to come! Since getting back into Tribal bellydance I’ve been working on adding in other elements to keep my body strong and healthy. I’m loving Yoga these days, and want to share with you some great FREE Youtube videos channels that are simply perfect for helping to strengthen and open your body to the dance. While we practice different movements and drills to get the individual elements into our bodies, building strength and flexibility can make it much easier to execute each move, not to mention build the stamina we need to dance longer. Here’s a nice one to start with – Kino’s free hip opener which includes pilates exercises that will help strengthen your hips too. You can find it free on youtube on her channel. So many of our tribal movements are based in our hips, and this is a great way to ease into having open and flexible hips that can not only perform the movements better but also hold up to doing them repetitively. This video is one of my go to’s for stretching the shoulders. Those of us who work in offices can get super tight here, and nice open shoulder/chest area is important for all of our ribcage and torso movements. Start here – gently! – and you’ll discover that stretching these areas can really help improve chest mobility in your moves. Restorative yoga is a gentle and relaxing practice that offers the benefits of deep stretching while relaxing. I like to think of it as twice the benefit in the same amount of time – you get to stretch and improve your flexibility while working on destressing too. 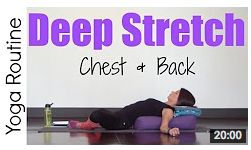 In this video, you can learn how to use pillows (you don’t need bolsters – I usually get creative and use couch pillows) and other props to build support to open up your chest. Mahin is absolutely one of my favorite creators of super helpful drill and stretch videos. She really knows her stuff, and has an excellent understanding of anatomy to back up her instruction. In this video she gives tips on a few gentle stretches that can improve your bellydance posture. As with ALL movement practices, take it easy if you’ve never done stretches or Yoga, or if you haven’t done them in a while. Listen to your body and move within your own bounds in order to prevent strains and injuries.